Meridians: The Journal of Acupuncture and Oriental Medicine is the official journal of the American Society of Acupuncturists (ASA). As a Medline-compliant journal, we publish peer reviewed scientific articles that focus on the professional practice of acupuncture and Oriental medicine. The journal is indexed in EBSCO's international Academic Search database and CINAHL, which provides broad content coverage for a wide number of nursing specialties. 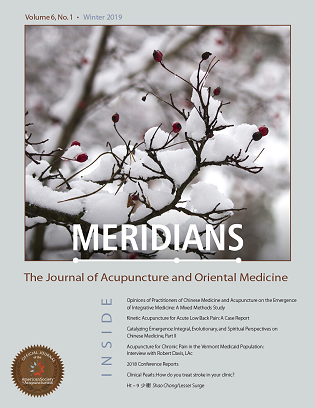 Meridians: JAOM welcomes papers from published and first-time authors on aspects of acupuncture and Oriental medicine, including original research, clinical practice, case reports, meta-analyses, evidence-based and integrative medicine, literature reviews, business practice, policy, nomenclature, translations and related disciplines. Please read our Author Guidelines for complete submission information. Meridians: JAOM publishes quarterly. Submissions welcome on an ongoing basis. Submissions to be considered for our Spring 2019 issue are due by or before December 15, 2018. The Winter 2019 issue is now online! Free online access to all ASA state association members. To read the current online issue and all past issues at our site, each ASA state association member is invited to self-register (just one time only), log in, and then select "Individual Issues." Check with your state association's website - you also may be able to access all MJAOM issues there. Please Note: The print copies are wonderful to hold and read! To receive both print copies & online access or just online-only access: "Subscriptions"
PUBLIC ACCESS to ALL issues (abstracts only for research and case report articles) are always available and require no login. Public Access issues provide complete access to commentaries, conference reports, book reviews, Clinical Pearls and more. Interested in learning how to research and write? Interested in how to make a poster for a conference presentation? All this and more is at: Author Research/Resources. Clinical Pearls Call for Submissions: How do you treat post traumatic stress in your clinic?